Y my note 2 always stuck??? I have just known,official NoteII N7100 imported to Thailand, it's hardware not support 4G LTE! Stebelluk, 24 Oct 2012I love the phone, it's so fast but I have an annoying light blue semi circle tab at the edge o... moreGo to your browser setting - Go to "Labs" - Deactivate "Quick controls". I love the phone, it's so fast but I have an annoying light blue semi circle tab at the edge of the screen (pop out shortcut bar) that comes and goes randomly. Anyone any idea how I can stop it? 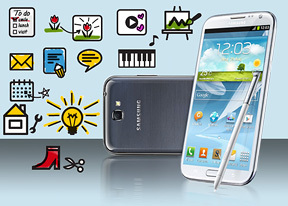 Jeffry, 16 Sep 2012Hi Admin, Did the Samsung Galaxy Note II battery can fit on Original Note body? I hope no because not battery is 2500 mah and note 2 battery is 3100 mah. sai, 20 Sep 2012i like this phone very muchNice phone.i purchase it now and feel better comparing other phones.